The Grand Steel team has over 150 years of combined experience in steel supply, steel slitting, and steel services. As a second generation steel service center, we are a tight-knit, family-owned operation that focuses on forming lasting relationships with our customers. By working to understand our customers’ needs, we are able to help them quickly and effectively address the challenges that their operations are facing. Jim Barnett is CEO of Grand Steel Products. He has been in the steel industry for over 45 years, starting with Republic Steel Corp. in the 60s and transitioning into steel distribution in the 70s where he held various staff positions with steel service centers. He also worked for an international steel trading company in Belgium and Germany. During the late 70s he established a Detroit distributorship which he ran through the early 90s. After selling this division, Mr. Barnett joined a national service center as VP of Tandem Rolled Products before establishing Grand Steel Products in 1995. 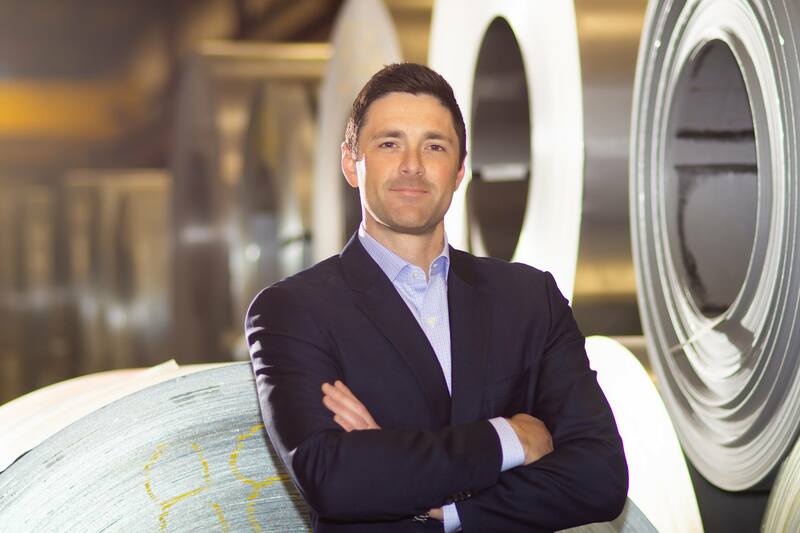 Seizing on the new industry transformation and Mr. Barnett’s experience in steel distribution, Grand Steel has grown in size and today distributes flat rolled steel products throughout North America. Barnett is also a Past-President of The Association of Steel Distributors, a national trade group comprised of steel mills, service centers, processors, and others who use this association as a networking platform to expand and enhance member businesses. He was also on the Executive Committee and was Chairman of the long-range planning committee until the association’s recent merger into FMA. Mr. Barnett was also awarded the ASD Steel Man of the Year Award in 2014 which acknowledged his contributions to the industry and to this organization for 45 years. Mr. Barnett has spoken at meetings and conferences within the metals industry and has been quoted in articles appearing in the Wall Street Journal, New York Times, The American Metal Market, and other periodicals. Mike Barnett is Executive Vice President and co-owner of Grand Steel Products. After graduating from Western Michigan University in 2003 with a degree in Finance and Economics, Mike started his professional career in the finance world. After a few years in sales, he was fast-tracked into a management program where he learned many valuable management skills. During that tenure, he was encouraged by his father to join Grand Steel Products, which he did in early 2006. Mike has overseen the growth of Grand Steel Products, including the purchase of an operations building in 2008, purchase and installation of a slitting line in 2011, an office/building addition/renovation in 2014, among other purchases and acquisitions. Mike also assisted in the formation of Barnett Industrial Properties and Grand Steel Transport, where he is a Partner. Outside of the office, Mike has a wife and 3 small children. He was a four-year collegiate boxer with a record of 12-0, but now prefers non-contact sports and is an avid golfer and squash player. He is very active with The Friendship Circle of Michigan (frienshipcircle.org), a non-profit organization which supports individuals with special needs and their families by providing recreational, social, educational and vocational programming. Mike has served as the coach of the sports program, sat on event boards, and continues to be a fundraiser and advocate for this amazing organization. Other charitable organizations which Mike is currently involved with include The Childrens Tumor Foundation (ctf.org), with a mission to end Neurofibromatosis (NF), and LUNGevity (longevity.org), the nation’s largest lung cancer-focused non-profit. Mike is a champion for a strong domestic steel industry and the growth of domestic manufacturing, working hard every day to promote the strength, growth, and change needed to sustain this and attending many industry events.